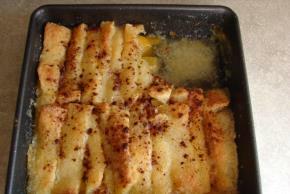 Preheat oven to 350 degrees F. Place fruit in baking dish (8-by-8 inches, or larger). Cut crust from bread and cut each slice into five strips. Place strips over peaches. Mix sugar, flour, egg, and margarine. Blend well, and pour over bread strips. Bake 35-45 minutes or until golden brown.